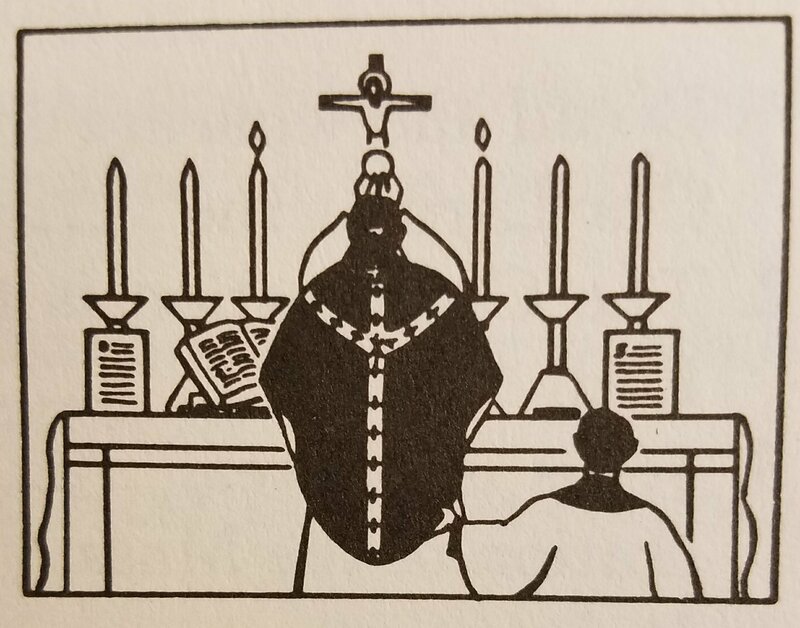 After the prayer to the Holy Ghost, the priest goes to the Epistle side of the altar. 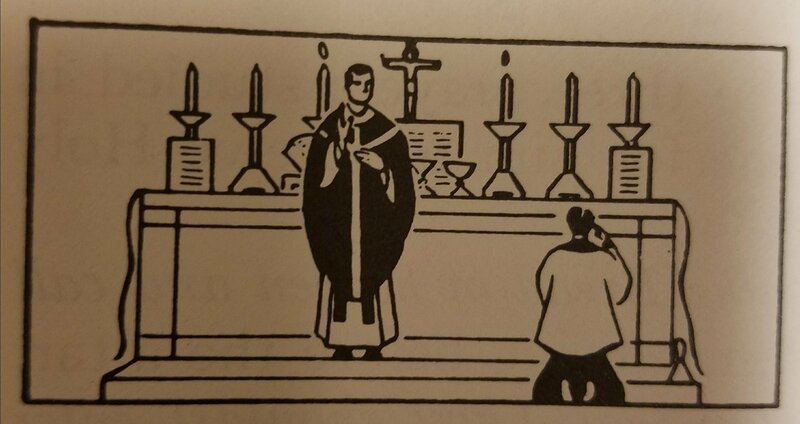 There the altar boy pours a little water over his fingers. 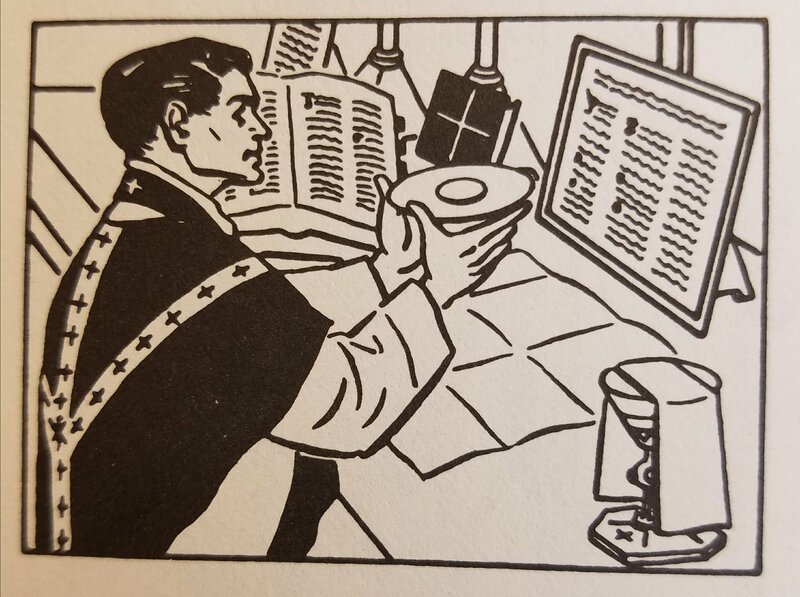 As the priest washes his fingers, he says a Psalm from the Bible that begins with the words, “I will wash my hands.” This part of the Mass is called Lavabo, because lavabo is the Latin word for “I will wash,” and the first word in the Psalm as the priest recites it in Latin. The Psalm speaks of two things in particular, desire of pardon for sin and God’s glory. 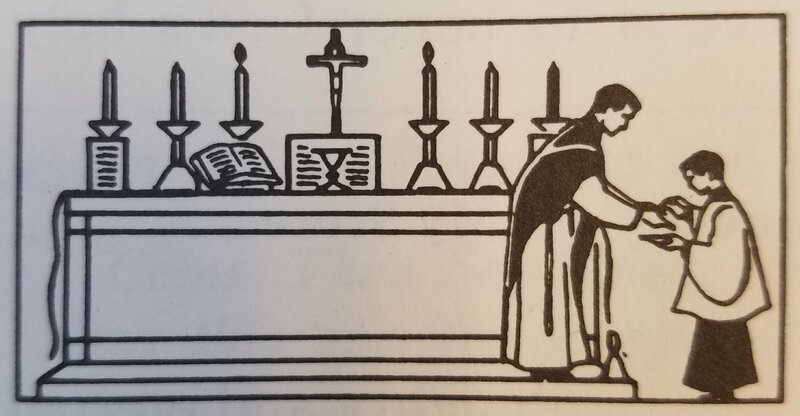 Long ago, the priest washed his fingers because they often became soiled as they received the gifts the people brought. 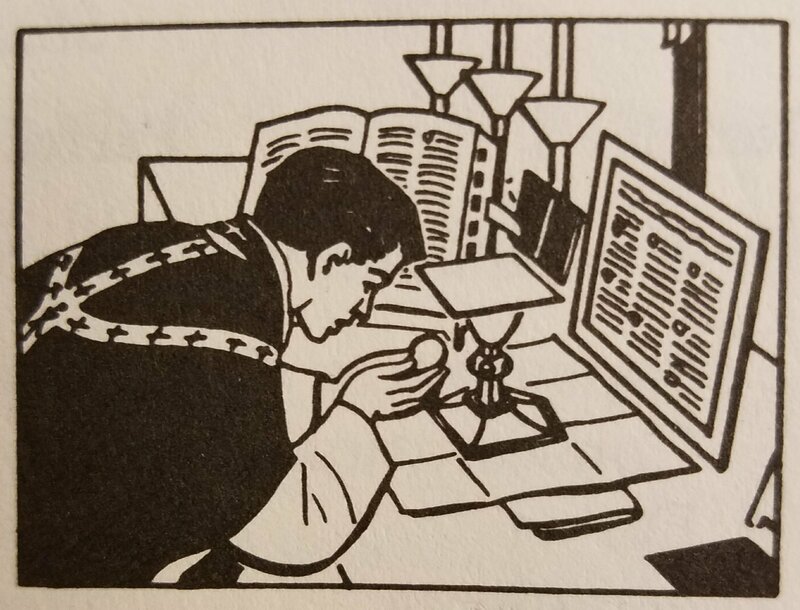 Today, the priest continues to wash his fingers, but as a sign that he wishes his soul to be made clean from sin. 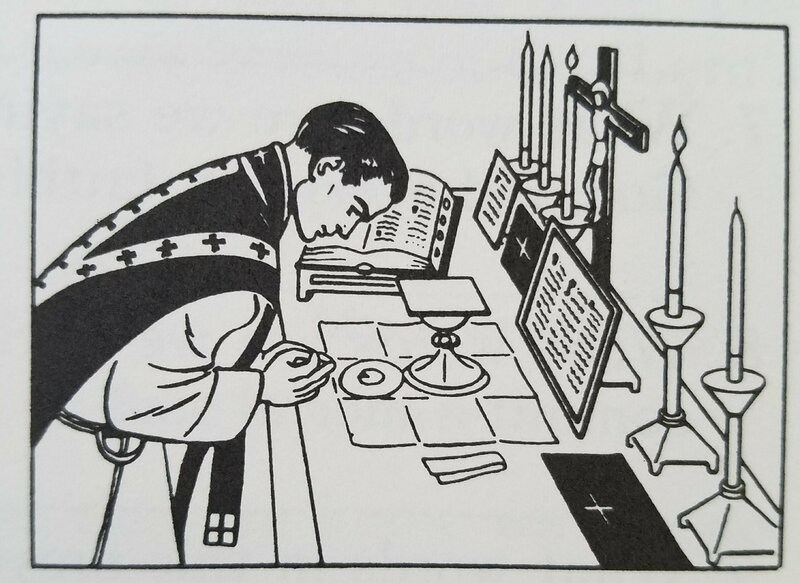 The people say the Psalm for the same reasons as the priest, to ask pardon of God for their sins and to tell Him that they wish to honor Him. Come, Thou Sanctifier, almighty and eternal God, and bless this sacrifice prepared for the glory of Thy holy name. 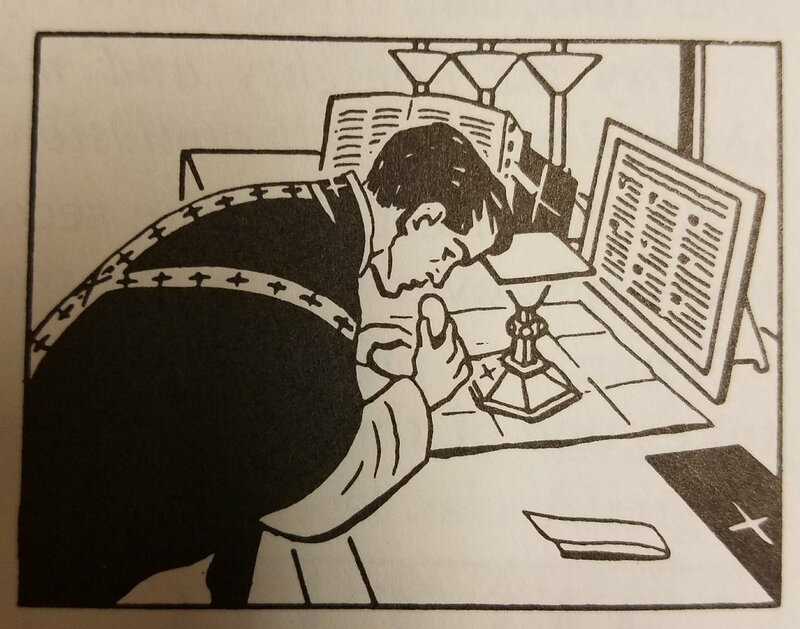 As soon as the priest has made the short prayer in which we offer ourselves to God, he raises his head. At the same time he raises his hands toward heaven and prays to the Holy Ghost. 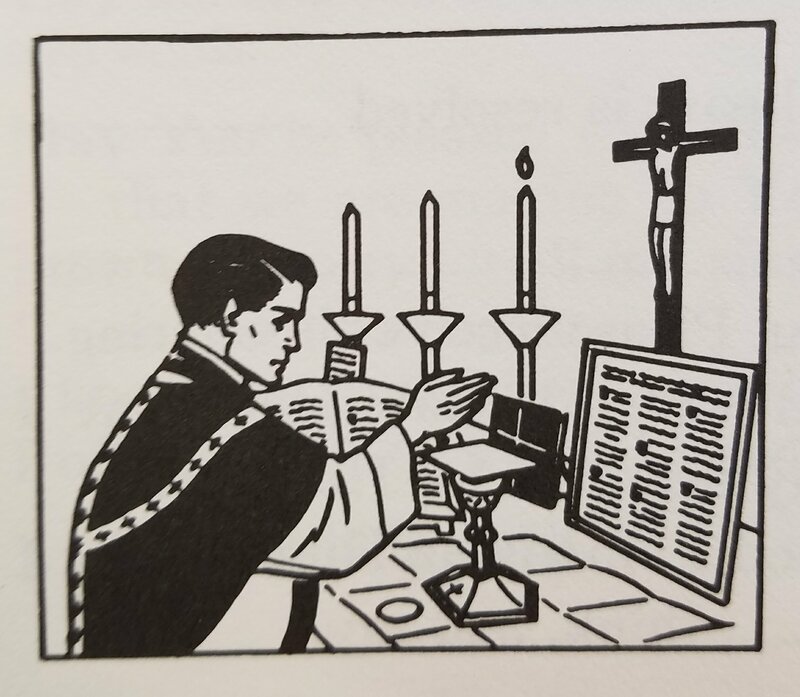 He asks the Holy Ghost to bless the offering he is going to make to God at the Consecration of the Mass. Thou Sanctifier is a name for the Holy Ghost. 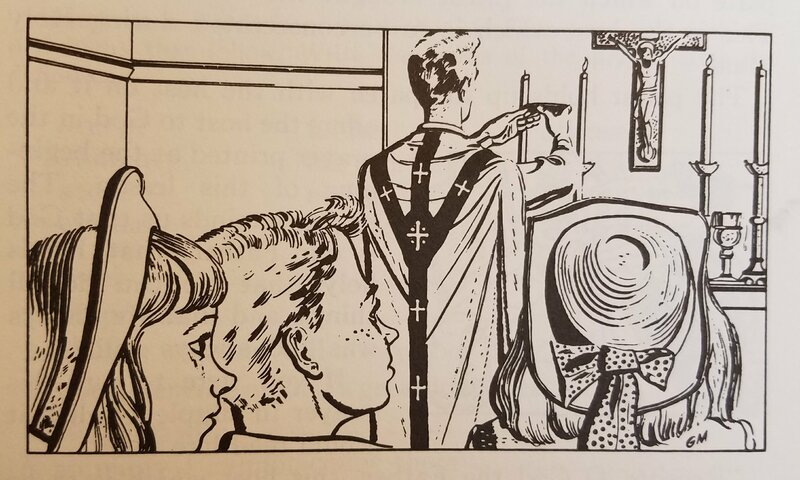 In the Catechism you learned that the Holy Ghost makes our souls holy through the gift of grace. This is another way for saying that the Holy Ghost sanctifies us. Accept, O holy Father, almighty and eternal God, this spotless host which I, Thy unworthy servant, offer unto Thee, my living and true God, to atone for my numberless sins, offenses, and negligences; on behalf of all here present and likewise for all faithful Christians, living and dead, that it may profit me and them as a means of salvation unto life everlasting. Amen. 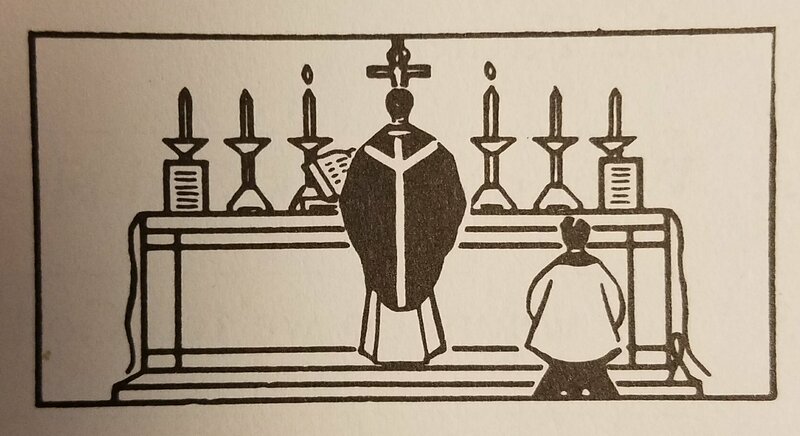 Long ago, people brought their gifts for the Church to the altar at the beginning of the Offertory of the Mass. During this time the choir sang a Psalm from the Bible. Today, a few sentences are read at the beginning of the Offertory. They contain part of the Psalm that the choir once sang. 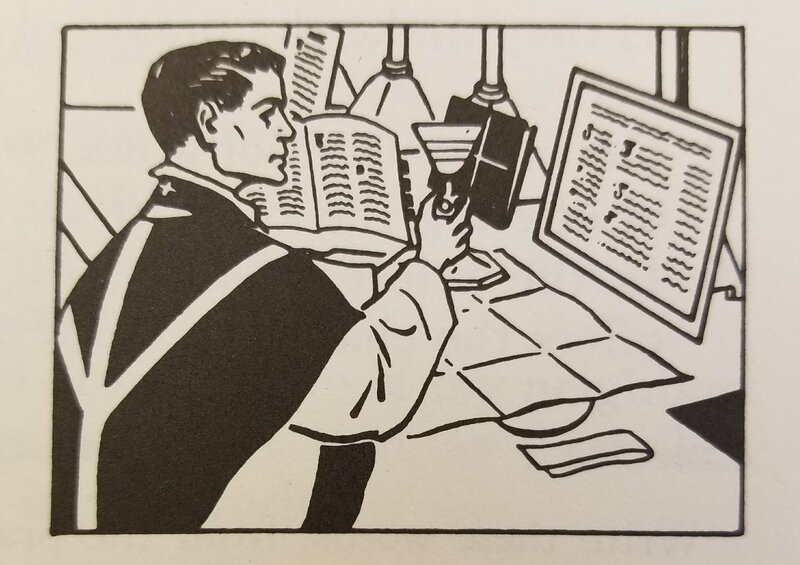 The priest reads this short prayer from the Missal. It is called the Offertory of the day and changes daily. 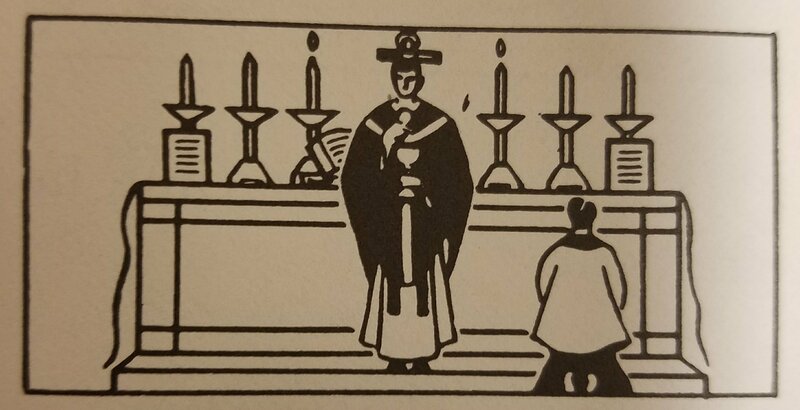 After the Offertory prayer the priest is ready to say the prayer offering the host to God. 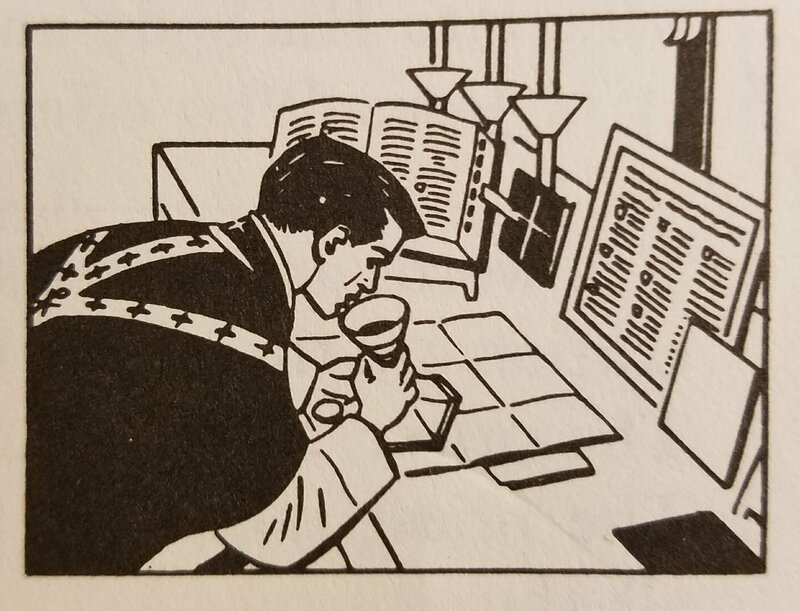 First, he takes the veil off the chalice and puts it on the right side. You already know that the paten is the small gold-like plate on which the priest brought the host to the altar. This is the host which is to be consecrated during Holy Mass. 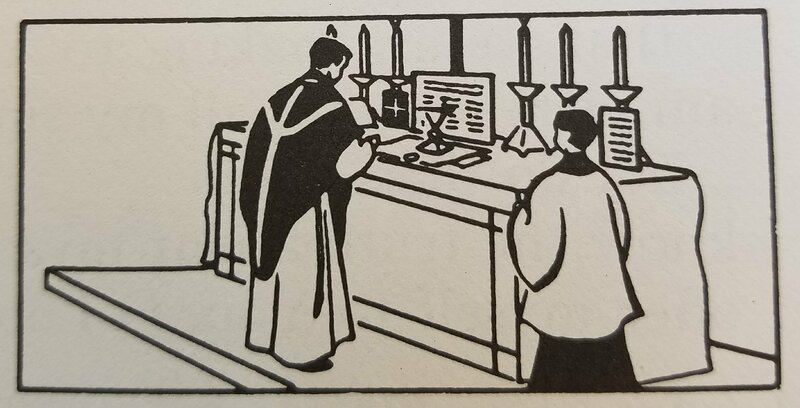 The priest holds up the paten with the host on it and offers the host to God in the prayer printed at the beginning of this lesson. The prayer reminds us that God is our Father, that He is holy, that He can do all things, and that He always was and always will be. 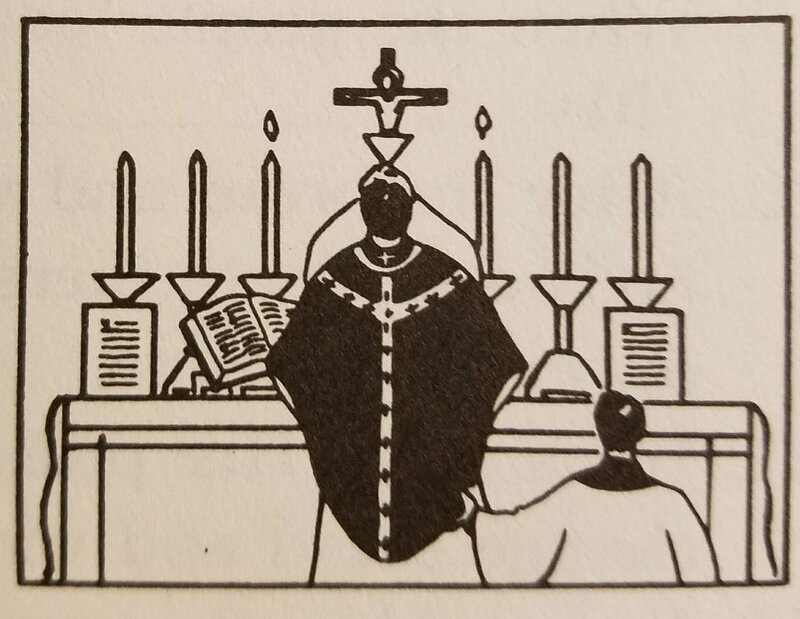 This prayer tells us that the priest is offering the Holy Sacrifice of the Mass to atone for his sins, and to pray for all present and for all faithful Christians, living and dead. The prayer reminds us of the love that Christians should have for one another and, first of all, for the people of their own parish.